Live or die in Yharnam, a difficult choice either way but why not try to survive? In this section of the guide we will reveal how to survive Bloodborne obscure Yharnam and its crazy people telling you about the secrets of the game in a number of tips that will be vital for the new Hunters! Don’t take personally if you undergo too many defeats, it is clear that sometimes you'll want to break the game disc and cursed a god is not listening but death in Bloodborne is part of the experience. To die means to analyze and understand where was the mistake that made you lose, you die evaluate and try again with the right knowledge and also takes you die in DREAM HUNTER, where to buy useful items, weapons and boost parameters. In Bloodborne there is no chance to defend yourself but exist to dodge attacks. The vast majority of enemy attacks and also the Boss, can be skillfully dodge by pressing the circle button and the direction to dodge. On some occasions you will hear of no escape so don’t be afraid and act cowardly, dodging and running away waiting for a better opportunity. By studying the enemies, you will soon understand their movements and will be able to dodge all their attacks. If you get hit, remember that you can immediately recover a bit of vital energy lost quickly hitting the enemy. Under the bar of the Life Points you can see a green bar that is consumed with each action. This is the bar of the resistance that you'll have to constantly keep an eye on during the fighting to avoid to stay dry. The bar will recharge as soon as you stop to attack, make shot or dodge. If you attack a monster insistently, attack made with the download bar will be slow and will not block the combo of enemies who will be free to attack you and make you into pieces as you cannot dodge even more resistance reduced to 0. During the fighting then try to find your rhythm between attack, dodge and rest, the right balance between these actions will allow you to better address any fight. In DREAM HUNTER will see a big DOLL sitting motionless at the beginning of the stairs leading to the church. It is the character of the automaton can use ECHOES OF BLOOD collected Yharnam to enhance your parameters. With each upgrade will increase the cost in Echoes of the next level up, and it will increase more and the parameters of the defense, regardless of the chosen enhancement. Before you can face a Boss or begin to wander almost quietly in the early zones Yharnam have to reach level 20 or higher. To arouse the automaton from its sleep you will have to reach a boss for the first time. The earliest that you can find are the Cleric Beast and Father Gascoigne, you just get to one of them, of course you will be massacred but you will wake up in the limbo in which the automaton is set up and ready to provide its services. To start, the best features are surely to strengthen the attack value of the weapon white and the resistance will become longer is faster in charging. If you want you can also start or enhance some point life but what about the other features better to wait for the later stages because initially there will be very useful. Empower yourself is not enough, we will also enhance our armamentarium. On the streets of Yharnam are of special stones called GEMS OF BLOOD, which can be used to upgrade weapons inside the church on top of the hill in the Dream Hunter. These gems are often hidden along with other important objects in the game world so pay attention to your surroundings. 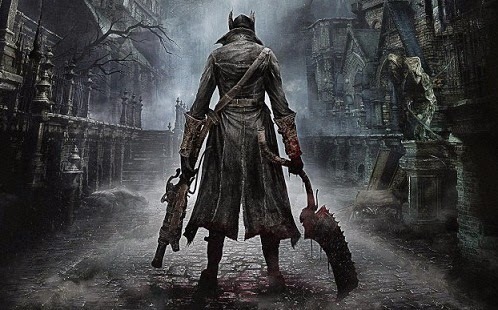 In the world of Bloodborne there is a default route to follow but there are many secret passages and hidden shortcuts by elements of the gameplay. Often are reduced to small deviations but sometimes can take you to discover a new area with more enemies, bosses and secret items. Try to destroy everything and always look in every corner because the labyrinthine Yharnam is a city full of mysteries. You don’t always have to fight all the enemies in each area, very often we can simply run to overcome them and reach new avenues to explore. Once again return to dance the resistance parameter which depends the race. Have a good resistance will help in run faster and for longer, think carefully during upgrades. In the city of Yharnam you sometimes see red lanterns hung or placed on the ground next to some doors. The lanterns indicate that you can knock on the door and that a city dweller will respond by providing information about the game, treating as a "dirty foreigner" or proposing some quests. There are several submissions to accomplish that need to deliver items, find safe places, killing animals and much more that will provide rich rewards to be used for the power-ups and weapons of the character. Give ear so why Yharnam watching you. The boss of the game are called Prey. Killing them will unlock a new lantern and you can restart the game starting from the place where you have eliminated the boss. In addition to this you can get large amounts of Echoes of the Blood and precious objects that will be added in the inventory or unlock in the shop inside the Dream Hunter. Some of these objects are used to continue the adventure by giving you access to new areas of Yharnam. Others are very powerful weapons that can be used only after reaching the required level in the parameters of the weapon. Firearms work with bullets Mercury soaked in the blood of the hunter. Precisely for this vital energy and should be used as if they are Jolly to play in the most difficult. Firearms are particularly useful to stop the combo of enemies, especially those of the bosses who often remain stunned allowing you to hit them to death with your weapon. The small white souls coming out of the floor, are called Messengers. They will help you understand the game world by providing important tips on adventure, on certain bosses, or telling you about secrets of the city to get new and valuable objects. In Dream will find several messengers who will explain the basics of combat and manage the store objects. Through NOTEBOOK you can leave messages to these creatures that provide them to other players to help them in the hunt. Often the Messengers will advise you to use the BELL, obtain after encounter with the first boss, to call allies. The game allows you to use it a point to call INTUITION, in certain areas, other players or NPCs that will help you to face the enemy. These characters will provide support but will stop the cooperation with a shot of a SPECIAL GUN that you will be supplied with the Bell.